November 4, 2014, Bangalore. Unitus Ventures (formerly Unitus Seed Fund) announced the appointment of seven regional Startup Scouts to expand its entrepreneur outreach into more parts of India. Unitus now has new presence across India’s West, East, and North in addition to a broader presence in the South. Scouts are now on the ground in Odisha, Tamil Nadu, Telangana, Maharashtra, Delhi/NRC, Uttar Pradesh & Rajasthan. Our Startup Scouts will be actively participating in the local startup community and developing relationships and partnerships with other local investors, angel groups, entrepreneur groups, business incubators/accelerators, higher education institutions, and more. Our India Impact Acceleration Program (IIAP) has three pillars: scouting for startups across the country, improving the incubator ecosystem, and helping portfolio companies thrive. IIAP is made possible in part by a Global Development Alliance with the U.S. Global Development Lab which is a new entity within USAID that seeks to increase the application of science, technology, innovation and partnerships to achieve, sustain and extend USAID’s development impact to help hundreds of millions of people lift themselves out of extreme poverty. Unitus Ventures (formerly Unitus Seed Fund) is the leading venture seed fund supporting startups innovating for the masses in India. Unitus invests in healthcare, education, mobile commerce & value-added services, marketplaces & e-commerce, retail & distribution, agriculture, and water & energy sectors. Founded in 2012, Unitus Ventures (formerly Unitus Seed Fund) is part of the Unitus Group, a premier financial services group operating in India and other emerging markets since 2000. 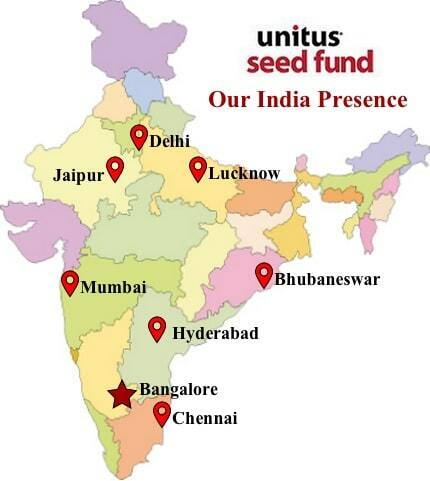 Unitus Ventures (formerly Unitus Seed Fund) is based in Bangalore and Seattle.